Grade 13 Ball Bearing Hinge, Square (Max Load 120kg). The most popular type of door hinge on the market today. These are a perfect choice for when you have doors of 40mm or 44mm firecheck, internal or external. They have a CE mark and are Certifire tested. Suitable for industrial, commercial and domestic use. Ball bearing hinges have always been very popular for their smooth operation, durability, long lasting design and ability to carry heavier loads than washered hinges. 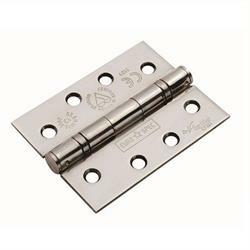 For standard internal residential doors a pair of hinges is adequate; however fitting 3 hinges per door has its advantages. It will look aesthetically pleasing and from a practical viewpoint it helps spread the load evenly and will help to overcome twisting or warping. This can sometimes happen to doors over a period of time where heat and moisture are a factor. Comes with a 25 year mechanical guarantee and are fire door rated. Buying this product will earn 79 Loyalty Points. Be the first to submit a review for the Enduro Grade 13 Ball Bearing Hinge 102x76x3mm/ 3 pack.